CTA is a non-invasive method of detecting narrowings or blockages in the coronary arteries. Coronary CTA uses advanced CT technology, along with a small volume of dye (intravenous contrast material) to obtain high-resolution, three-dimensional images of the heart and its arteries (coronary arteries) non-invasively. 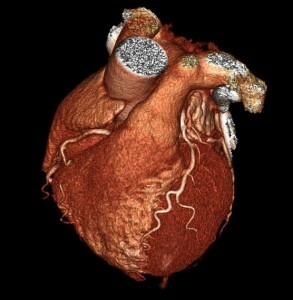 Coronary CTA is also called multi-slice computed tomography (MSCT), cardiac CT or cardiac CTA. During CTA, x-rays pass through the body and are picked up by detectors in the scanner that produce 3D images on a computer screen. These images enable physicians to determine whether cholesterol plaques are present in the artery walls. A Coronary CTA can be performed much faster (in less than one minute) than a cardiac catheterization (coronary angiogram), with potentially less risk and discomfort as well as decreased recovery time. Shows whether coronary arteries are normal or not. Abnormal arteries may demonstrate cholesterol build-up (soft or calcified plaque) and any narrowing (stenosis) due to the plaques. Demonstrates any abnormal origins of the coronary arteries. Occasionally non-cardiac abnormalities such as lung lesions may be noted as incidental findings. Coronary angiogram (also called cardiac catheterization or ‘cath’) is one of the most common invasive heart imaging procedures and is the standard method for diagnosing coronary artery disease. During a cardiac cath, a catheter is inserted through a blood vessel in the groin or wrist and guided into the heart with the aid of a special x-ray machine. A small amount of contrast material is then injected through the catheter and into the arteries and heart. The average catheterization procedure lasts about 30 minutes, but the preparation and recovery time add several hours. Often patients are admitted overnight for the procedure. While coronary angiograms remain the ‘gold standard’ for detecting coronary artery stenosis (significant narrowing of the arteries which could require stents or bypass surgery), Coronary CTA may confidently exclude coronary stenosis in a number of patients thus avoiding the need for an invasive angiogram. Additionally, Coronary CTA can non-invasively detect cholesterol build up in the coronary artery walls that may lead to future problems without lifestyle changes or medical treatment. Who should consider Coronary CTA? The single most important step for patients trying to determine whether they should have a Coronary CTA is a consultation with their general practitioner or the cardiologist. Appropriate use of Coronary CTA is important as the scan carries a very small risk from X-ray exposure and contrast dye exposure. Calcium score is a non-contrast CT that evaluates plaque which is calcified. While it gives an excellent assessment of the cholesterol burden in your arteries, it does not tell whether someone has blockages or not. It’s best value is in asymptomatic patients to determine the presence and the extent of plaque buildup in their arteries allowing subsequent risk factor modifications by their practitioners. Patients who are highly likely to have blockages are better investigated with coronary angiography since angiography is required to confirm and treat (stents or bypass surgery) any significant stenosis detected on Coronary CTA. Such patients include those with a clear history of chest pain during heavy physical activity at high risk of a cardiovascular adverse event, strongly positive stress-test results and known history of coronary artery disease or heart attack. Similarly, cardiac CT is of little value in asymptomatic patients and is generally avoided in female patients under the age of 40 years due to small long-term risks associated with radiation exposure. What type of scanner is used? 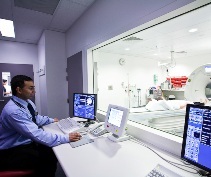 At present we use a latest generation CT scanner (320 slice Toshiba) through MonashHeart, which produces excellent image quality at a very low dose of radiation. All necessary precautions are taken to minimize radiation dose. Coronary CTA is a relatively simple non-invasive procedure, which takes less than 10 minutes on the scanning table. You will have a small cannula inserted in your arm to be able to give contrast material. We may need to give a medication called beta-blocker to slow down the heart rate if your heart rate is high prior to the scan. Once the heart rate is satisfactory, you will lie on the CT table and a contrast material will be injected into your vein so the imaging physician (cardiologist) can view the heart and blood vessels on the CT image. It is very important that you lie as still as possible during the entire procedure because any movement could blur the images. You may be asked to hold your breath briefly at intervals when the images are taken. After the contrast agent is injected, you may feel flushed, or you might have a metallic taste in your mouth. These are common reactions. If you experience shortness of breath or any unusual symptoms, please tell the technologist. Generally, you can resume your usual activities and normal diet immediately after the test. If we have to give extra beta-blockers which, on rare occasions, can lower the blood pressure, we may ask someone else to drive you back. Coronary CTA carries no cost to the patient when organized by your Melbourne Heart Care specialist. Calcium score incurs a cost of $250, as there is no Medicare rebate currently available for this test.